Last July I was scurrying around my old kitchen to create sugar free low fat whole food treats for the guests that would arrive when I hosted poetry night at the Asbury Street house. But this July poetry night was literally a walk in the park. It was being hosted quite a ways farther south than my new place, which is “up north” but “down” in what used to be called “frog hollow.” Still, if Romeo and I made it up the one transitional hill we discovered is our best bet to get up out of the slight “hollow” to go further east or southeast, I was curious how many blocks it would be before we got to Moscow’s gem, East City Park. The couple who was hosting poetry night live just a half block east of this grand green bowl filled with beautiful old trees and a stage snack dab in the middle of it. These assets have made it an indispensable home for the Moscow Renaissance Fair over the last 40 plus years. We were thick in the middle of one of several heat waves. The day was just starting to cool off, and a walk in the gathering evening was a welcome thought. It was that, along with my sense of neighborhood exploration, that caused me to call my ride at the last minute and change plans. Romeo and I would walk and meet them there, and accept a ride home at the end of the evening. It was a lovely, if somewhat long, walk. I’m still astounded by how something that was once so completely out of the question as to have never even been conceived of, let alone considered, is now rather comfortably doable. And as long as I’ve lived in Moscow, I’d never entered the park from this particular vantage point. Friends I’m now living closer to would speak of walking or biking down to the park this way, and I would wonder with longing what that might be like. As we entered the northeast edge of the park 3 small children deserted a game of basketball with their Dad and fluttered around us, hoping for a chance to pet Romeo. Since we weren’t in a crowd or a high pressure situation, and they all asked politely, I let them each take a turn, with a reminder to be gentle. Their mother stood in the background and said “what a beautiful dog.” And I answered “what beautiful children.” After that sweet welcome, we descended down into the bowl of the park, first following a path, then cutting across grass for Romeo to smell, toward a bench where I thought it might be nice to take five before going on to poetry night. I ended up sitting next to an activist friend I hadn’t seen in a while, who still lives here some of the time. He hadn’t known I had moved. He said, “you know, I walked by your house and something felt different, so I wondered.” He was really pleased to hear my rezoning story, and we also agreed on the joys of found ripe fruit hanging over fences along the sidewalks in old neighborhoods. When I got to my poetry night destination, I was greeted with open arms and praise from the host, who said she remembered a time when walking to her house would have been out of the question. She exclaimed, “Look how far you’ve come!” and she meant it on every level she could think of. This same person also calls me ” a health nut,” too, but, well, I am kind of a nut about it, so I don’t mind. The group was small that evening and the weather was warm, so we sat outside, on a new brick patio her husband had paved himself. In the tree above us was a nest full of baby robins. Their parents didn’t seem to mind us gathering below them, so in a way they were part of the group, as we settled in with our lanterns and flashlights and refreshments from the long table set out on the porch filled with goodies and wine and all manner of things I am better off not even thinking about eating. The host who had greeted me with open arms as I walked into their unfenced yard does a wonderful job making things look and feel festive. There were tiny light strung across the edge of the table and votives twinkling among the dishes, glasses and bottles. She called out to those of us who had already sat down what was available to drink. My usual is “just water,” since it helps me keep my throat lubricated if I read out loud, and I’d literally be under the chair if I had more than 3 sips of the wine. This particular host has taken to making simply flavored waters and that evening when I said “water” she said “cucumber water?” Well, that sounded really good. I once got an e-mail from someone with a list of something like 36 things you could do with cucumbers besides put them in a salad. I can’t remember much of any of it, except that they are good for your skin and full of B vitamins that help alleviate stress. And wasps are repelled by their smell. The long hot summers days are stressful for everyone, but they can be especially exhausting for those of us with MS. The heat effects me much less acutely and dramatically than it once did–I was often in danger of losing consciousness many years ago, and one year did and took a bad fall. But the exhaustion still can creep up less dramatically and drain me of energy and balance in subtle but insidious ways. 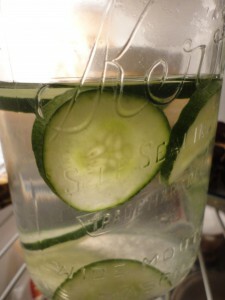 What better antidote than a chilled mason jar full of water and cucumber slices? I can’t think of one. The cucumbers in the water will be fine for a whole day and maybe a little bit more if you refrigerate it when not drinking. 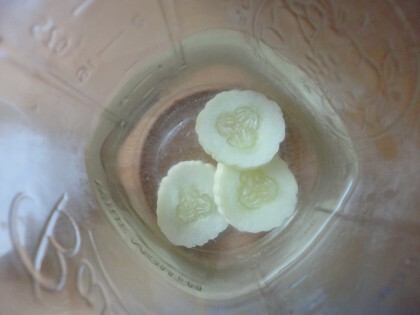 If you leave the cucumber water out in hot weather for a long time, it becomes more ephemeral. So eat up the cucumbers and drink up the water while ye may. Memories are funny-peculiar creatures with minds of their own, stretching and contracting like silly putty when I least expect it. As I write this, suddenly I can’t remember if this was the poetry night I first got served cucumber water or not. It might have been citrus water instead, and the cucumber water was the previous month, which I superimposed on my walk to the park, all summer poetry night memories merging into one calm ocean. No matter which exact one. I did learn to savor this simple cooling and calming treat at poetry night. I do remember both of the summertime poetry nights I’ve been to this year featured interest in the work of one of my former teachers, Charles Wright, who is currently Poet Laureate of the United States. The evening I walked through East City Park to poetry night I brought a single poem of his I copied into a “poems I love” journal I’ve kept over the years since I was 20. It’s also about memory, and the powerful ways it can shape us when we are left alone with it. I’ll leave you with its beautiful images, which I’ve carried with me since I first heard it in my mid-20’s. I’m lucky to have had Charles as a teacher. And I’m lucky to have friends here in Moscow who would ask me to read this out loud, not once, or twice, but three times, so they could savor every word. I’m here, on the dark porch, restyled in my mother’s chair. Swing down, on the canyon floor, to the sea. In this they resemble her, burning and disappearing. And I’m here, sizing the dark, saving my mother’s seat. Although I loved this poem in my 20’s, if such a thing is possible, I love it more now, maybe because I now feel what it’s literally like to be “restyled in my mother’s chair.” There were a handful of us in that small circle last poetry night who have lost our parents. Some of us are grandparents already, and some are seriously ill. Others of us have died in the last year or two. All the more reason to savor each elegantly simple pleasure. Adding a few cucumber slices to my ice water turns something ordinary and plain into a performance poem. One I can drink on a hot summer night while the crickets and cicadas sing. Beautiful Maria! All your words are poetic to me. From simple experiences come profound revelations. Memory is indeed pliable & tricky, but the feelings left is what really matters. Thank you for sharing such a lovely evening with us, and for the refreshing cucumber water recipe. I look forward to staying “cool as a cucumber” too! Oh, and I am thrilled for you that you and Romeo were able to walk so far. You truly have come a long way! Thank you, Debra, for all these kind thoughts and words. And yes, I so agree that the feelings left from memory are what really matter most of all. Here’s to staying cool as a cucumber! That sounds like a wonderful evening, walk and all! I recently had some cucumber water, but it also had a few strawberries thrown in, too – another nice combination. The things you can do! Savoring the simple pleasures- something we all should do more of. Welcome, Joyce, and thank you for this lovely comment!